This past week has been a bit of a washout cooking wise. We had the big birthday party and with it overnight guests and the obligatory sore heads the next day and then a wedding which seems to have eaten up the entire weekend − although I can’t think of many better ways to lose a weekend than in celebrating the union of two very special people. The result of all this is that I didn’t make any meatless dishes this week worthy of the blog, so I’m rehashing a previous vegetarian dish that I posted before I started the weekly Meatless Monday series. 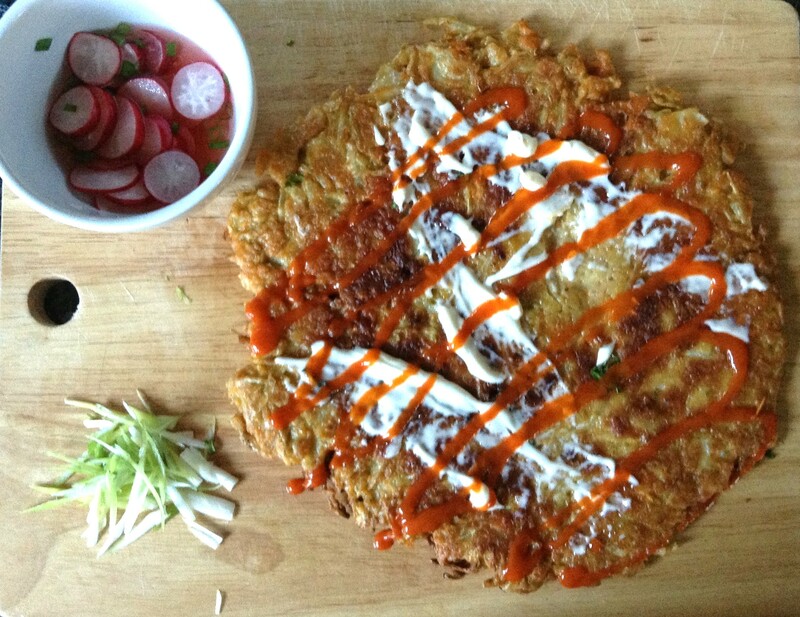 This is okonomiyaki, a Japanese pancake made from shredded vegetables and an easy-as-pie batter. Check out the original post here. It’s delicious and it’s a super good recipe to have in your arsenal when you’ve got nothing in your fridge except half a cabbage and some tired carrots, which seems to happen to us a lot. If you’re feeling really fancy, you can put a poached egg on top. Serve this for breakfast, brunch, lunch or dinner, you won’t be disappointed! It is great for summer. It is really minimum effort (I usually leave it on the stove and walk away for 10 minutes, then come back, flip it and leave it again), which is nice because it means you’re not slaving over the stove when it’s 30 degrees outside! I was looking for a new way to use cabbage and I just found it online and thought it looked great! I’d love to try it in Japan! Excellent summer fare. It looks very tasty. Thanks, it’s just so easy. I love anything that uses up things that might get thrown away (not in my house, of course!). These are always great for lunch! Lovely recipe.